Did you remember to wear red today? The American Heart Association’s Go Red for Women program to raise awareness for heart health in women began ten years ago. Even though 21% fewer women die from heart disease than before the program began, heart disease is still the number one killer of women. More women have become educated about heart disease and have taken action. Lipstick Logic LLP was created with women’s health in mind and a goal to promote factual health information for women of all ages. Along with our blog and presentations, February is a big month for Lipstick Logic. 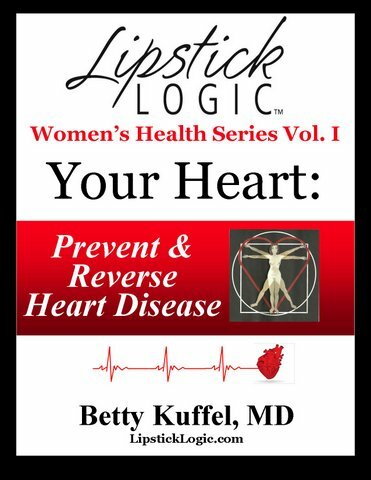 We will launch the first book in the Women’s Health Series, Volume I, Your Heart to be followed soon by Volume II which addresses obesity and related conditions including Type II diabetes, metabolic syndrome and how to combat excess weight. We will announce the release of Volume I in coming weeks. In the meantime, consider the following behaviors found to correlate with reduced heart disease and cardiac deaths. From a study reported last year from the Perelman School of Medicine at the University of Pennsylvania, only 0.2% of patients met all the criteria. In 2010, the American Heart Association targeted the following positive behaviors. In the Perlman study, over eleven years, those who met 3 to 4 of the steps to better health, benefited by a 55% reduction in cardiovascular health as compared to those who met two or less steps. Start now! Don’t wait until you have a heart attack!